The brand or common name for methamphetamine is Desoxyn. Methamphetamine is commonly known as “speed,” “meth,” and “chalk.” Other street names for methamphetamine include: beenies, blue meth, blue mollies, bomido, CR, crank, cranksters, crink, cris, croak, crossles, crypto, crystal, crystal meth, desocsins, desogtion, desocins, fire, go-fast, granulated orange, lines, methlies quik, mexican crack, peanut butter, powder, quill, rose, shabu, sketch, stove top, water, wet, white cross, wolminic nasal spray, yellow bam, yellow powder, and water. In its smoked form it is often referred to as “ice,” “crystal,” “crank,” and “glass.” Other street names for the smokeable form of methamphetamine include batu, cristy, hanyak, hiropon, hot ice, kaksonjae, L.A. glass, L.A. ice, quartz, super ice. Methamphetamine is a Schedule II stimulant, which means it has a high potential for abuse and is available only through a prescription that cannot be refilled. There are a few accepted medical reasons for its use, such as the treatment of narcolepsy, attention deficit disorder, and for short-term use-obesity; but these medical uses are limited. Methamphetamine is a man-made stimulant. The vast bulk of methamphetamine currently on the streets has been illegally manufactured. There is an increasing number of small scale labs being set up in rural areas of Midwestern states such as Missouri, Kansas, and Iowa. The chemicals used in the manufacturing process can be corrosive, explosive, flammable, toxic, and, possibly, radioactive. For every pound of finished product, 5 or 6 pounds of chemical waste is left at the illicit lab site. Possible ingredients include brick and driveway cleaner (muriatic acid/dilute hydrochloric acid), drain cleaner (lye/sodium hydroxide), starting fluid (ethyl ether), and “VICKS” nasal inhalers (desoxyephedrine). L-methamphetamine: Levo-methamphetamine raises the blood pressure and causes the heart to beat rapidly, but does not increase alertness very much. Shakes/tremors and stomach cramps are common physical side-effects. D/L-methamphetamine: Dextro-levo methamphetamine is made with the amalgam (P2P) method. It was popular during the 1960s, but it is still made and distributed. It has to be injected to get the desired rush and produces side effects such as shakes, tremors, and stomach cramps. D-methamphetamine: Dextro-methamphetamine is the most common currently. It is made by the ephedrine reduction process. It is 2 to 10 times as physiologically active as L-methamphetamine. It increases the heart rate, blood pressure, body temperature, and rate of breathing and dilates the pupils, and has fewer adverse side effects than the other two types of methamphetamine. The term “ice” most often refers to a pure form of d-methamphetamine HCI. “Ice,” is a smokeable form of methamphetamine. It is a large, usually clear crystal of high purity that is smoked in a glass pipe. The smoke is odorless, leaves a residue that can be resmoked, and produces effects that may continue for 12 hours or more. Methamphetamine comes in pill, powder, clear liquid, and rock form (that resembles a block of paraffin). The coloration of methamphetamine may vary significantly due to the manufacturing process and as a result, it may have a foul rancid odor. Possible colors include: colorless/white, red, orange, purple, green, and brown. Methamphetamine is commonly smoked, injected intravenously, or snorted. The primary route of administration varies, even within regions. Smoking is becoming the most popular method of administration followed closely by inhalation/sniffing. When it is smoked or injected intravenously, methamphetamine produces an intense, extremely pleasurable “rush”almost immediately that lasts only a few minutes, followed by euphoria, referred to as a “high.” Snorting or oral ingestion produces euphoria- a high but not an intense rush. Snorting produces effects within 3 to 5 minutes, and oral ingestion produces effects within 15 to 20 minutes. 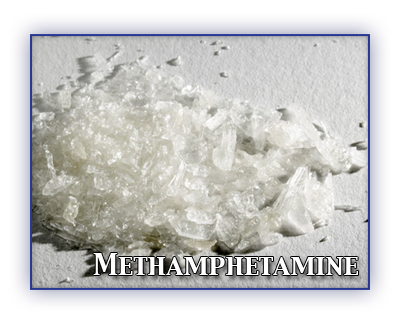 Methamphetamine is commonly combined with morphine, heroin or cocaine in a “speedball.” It is also used in conjunction with marijuana or alcohol. Methamphetamine is most often used in a “binge and crash” pattern. Tolerance for methamphetamine occurs within minutes- meaning that the pleasurable effects begin to disappear even before the drug concentration in the blood falls significantly- users try to maintain the high by binging on the drug. Users are referred to as a Meth head (regular user), Meth monster (one who has a violent reaction to methamphetamine), or Speed freak (habitual user of methamphetamine). The person may exhibit anxiousness, nervousness, incessant talking, extreme moodiness and irritability, purposelessness, repetitious behavior- such as picking at skin or pulling out hair, sleep disturbances, false sense of confidence and power, aggressive or violent behavior, disinterest in previously enjoyed activities, and severe depression. A person using alcohol while on methamphetamine, during the “tweaking” stage, can be identified by looking at their eyes. Their eyes will jerk back and forth when they look out of the corner of their eyes (a horizontal-gaze nystagmus). The chronic user of powdered methamphetamine is often undernourished with a gaunt appearance, poor hygiene, and bad teeth. Chronic abusers are violent and suffer rapid mood swings, with behavior going from friendly to hostile in seconds. If an abuser has taken a lethal dose of d-methamphetamine, the heart rate will rapidly increase and the abuser will collapse and suffer a heart attack or a stroke. The only overt signs of overdose are an abnormally high temperature or the symptoms of a heart attack or stroke. Methamphetamine will stay in the plasma between 4 to 6 hours. It can be detected in the urine one hour after use and up to 72 hours after use. Methamphetamine metabolites can be detected in the body for 2 to 4 days. Demographically, those seeking treatment for methamphetamine abuse are predominately white, equally male and female, and between 25 and 35 years old. Methamphetamine abusers have similar success rates as heroin, crack/cocaine, speedball or marijuana users in quitting drug use. Methamphetamine is typically used on a regular daily basis and users tend to integrate their drug use into many of their daily activities. Withdrawal frequently doesn’t occur for 90 days from the time of the last use, making treatment a long-time process. The most effective treatments for methamphetamine addiction are cognitive behavioral interventions. These approaches are designed to help modify the patient’s thinking, expectancies, and behaviors and to increase skills in coping with various life stressors. The 12 step program has been shown to have the greatest success rate among methamphetamine users.